Easy to use, with remarkable tones right out of the box, these models authentically replicate every component of the three exquisite amplifiers. From tubes to circuitry, every detail was painstakingly modeled part by part, using Waves’ Precision Analog Component technology, with Paul Reed Smith himself supplying Waves with the original amplifiers and the full schematics. PRS Archon delivers a shimmering clean or aggressive overdrive; push it harder and you get glorious distortion. With its lush gain, Archon is ideal for lead or crunching rhythm, while also offering a clean channel that players of all genres will appreciate. PRS Blue Sierra/V9: Never-before-released even in its hardware form, this ultra-rare amp was an early original format for the PRSJ-MOD 100. Evocative of boutique American guitar amps, it is equally great for clean sounds and for medium-gain overdrive tones. No matter the setting, you’ll find it easy to get a big 3D sound and hard to get a bad one. PRS Dallas provides the sounds of classic American reverb amps. The all-tube design produces an open classic tone for huge-sounding cleans, or multiple variations of overdriven sound with natural-sounding reverb. Originally designed by chief PRS amp builder Doug Sewell, this highly musical amp offers sweet highs, solid lows and beautiful mid-range tones. Different speakers and speaker cabinets produce different sounds. PRS SuperModels lets you choose from 8 different speaker cabinet IRs (audio snapshots of speaker cabinets), captured by Paul Reed Smith at his personal home studio using his proven microphones and mic preamps. As a bonus, you can add any of your favorite third-party IRs – up to two simultaneously. With three boutique amplifiers to choose from, PRS SuperModels places countless tone options at your fingertips. 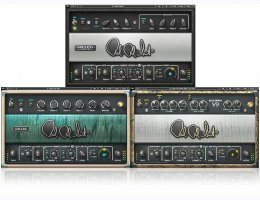 Whether you are playing rock, jazz, country, metal, blues or any other genre, this exquisite amp plugin suite will cover all your guitar-playing needs.